USDCAD extends to new highs. Lower oil helps to weaken the CAD. The CAD can be influenced by the price of oil. The price moved today from a high of $57.53 to a a low of $55.70 (currently trade at $55.95) and that helped to weaken the CAD. The USDCAD moved higher (back above the 200 day MA at 1.3146 today - see chart above). Sellers started to cover. The 100 hour MA (blue line) is ahead at 1.3186. That will be a hurdle that the price needs to get and stay above. 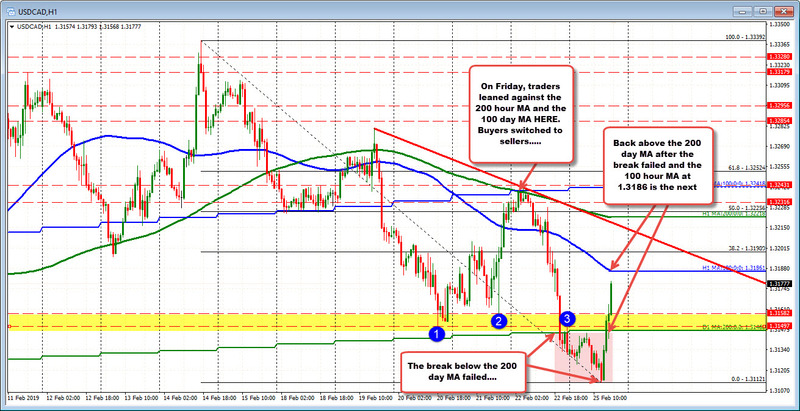 Last Thursday, the price moved above that 100 hour MA line but stallled at the 200 hour MA and 100 day MA (see chart). Like on the failure below the 200 day MA today, traders leaning agaiinst those levels (and holding), was enough to turn the buyers to sellers. The crowds gathered there and stalled the rally (see my latest video HERE about leaning on friends and technical levels). So buyers are back in control with the 100 hour MA eyed by traders for the next clues. Get above and the 200 hour MA and trend line will be eyed at 1.3220 area. Stay below the 100 hour MA (and there should be some stall at the 100 hour MA) and the battle lines will be drawn with the 200 day MA below a key support area.